The final battalion I needed for Bachelu's division in the French II Corps is the 3eme Ligne. 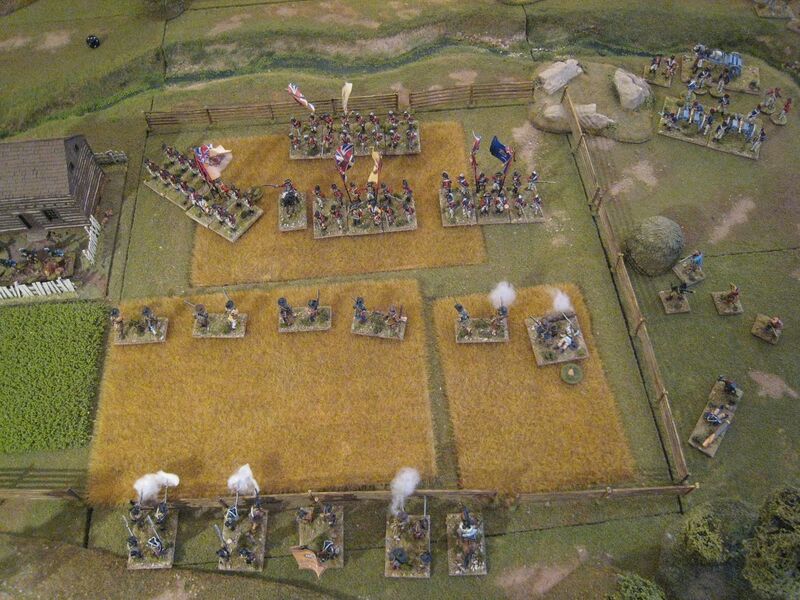 In the "General de Brigade" orbat the battalion fields 30 figures and skirmishers. I have done what I always do for units of this strength: 5 companies of 6 figures and then the voltiguer company out on skirmish stands. All figures are the Perry plastic infantry save for most of the command stand, which are from the metal "Command in Greatcoats" pack (the drummer and officer I will save for the next battalion I paint). 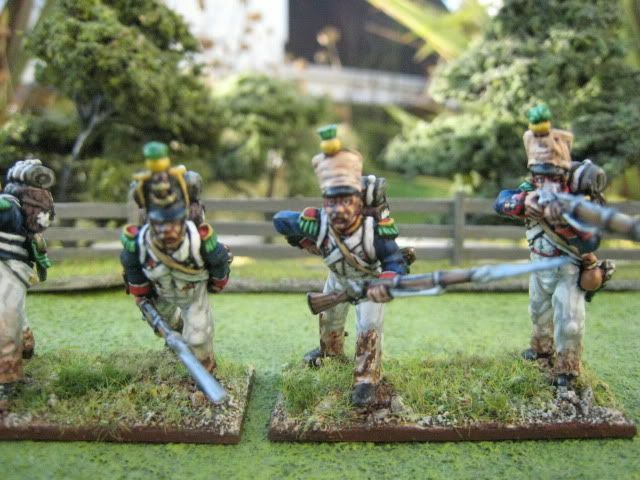 As I mentioned before, I sculpted some moustaches onto fusilier heads to provide more variety in the grenadier company. The Perry plastic box gives you lots of spare heads, but hardly any have moustaches. Rather than use the same old heads yet again I decided to convert some of the fusilier heads. It's interesting to see that once you add a moustache the character of the face changes completely - I suppose that may be one reason why people grow moustaches! I admit that I found this a bit of a challenge; the trickiest parts were ensuring equal growth on each side of the nose and retaining the nose itself. I'm not sure if I've executed these conversions particularly well, but at least I have some different faces in the grenadiers' ranks. I have a couple of other figures left over which look rather better. I decided to give this unit a more uniform look by painting all the greatcoats and shako covers the same colours (respectively, Foundry palettes "Slate Grey 32" and "Palomino 56"). 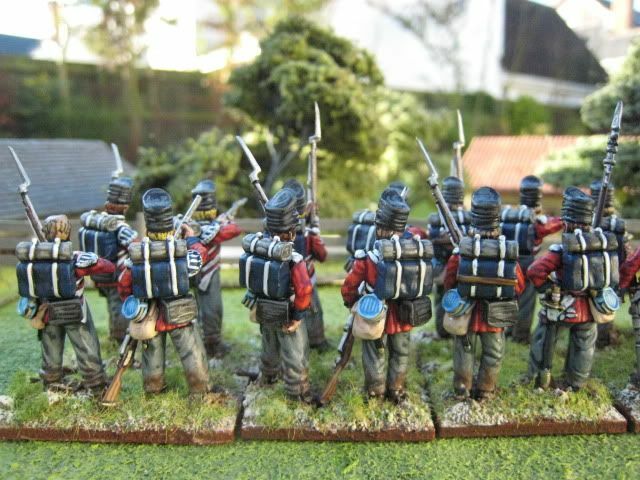 I also corrected a mistake I've made on all my other Napoleonic French infantry and did not add red edges to the coat turn-backs (which I gather was dropped around 1812/13). Otherwise, these were painted pretty much as all my previous French. 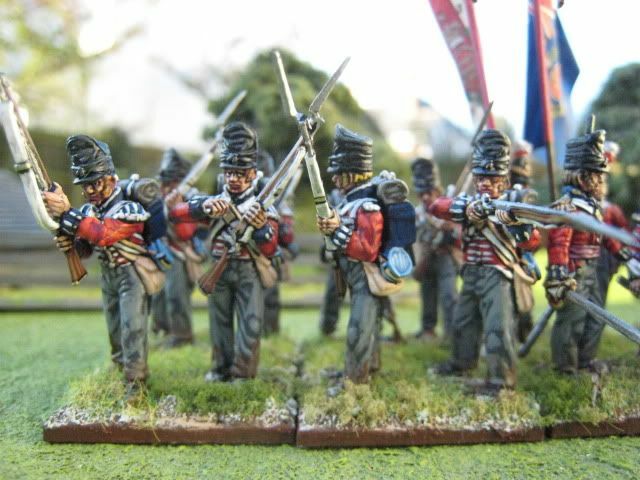 I'm working on some First Carlist War units at the moment (3 are "in the can" awaiting photographs) but the next Napoleonic work will be on brigade and divisional command stands and artillery. For the latter, I'm still undecided on what paints to use for French artillery woodwork. I wasn't satisfied with my earlier effort (using the specific Foundry triad), so if anyone has any tried and tested acrylic recipes I'd be most grateful to hear them. 36 figures. Painted November/December 2011. Flag from GMB. The 5th was raised in 1805. 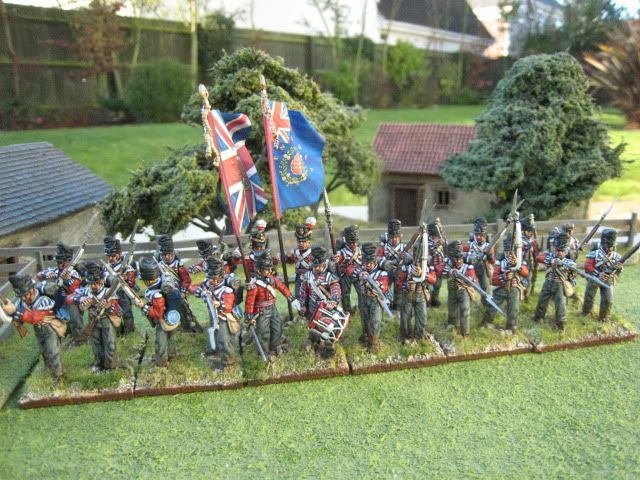 In 1815 it was brigaded with the 1st and 2nd Light Battalions and the 8th Line Battalion in the KGL 2nd Brigade under the command of Colonel von Ompteda. The brigade was part of Lieutenant-General Charles Alten's 3rd Division. The brigade was positioned to the rear of La Haye Sainte, just to the right of the main Brussells road. At some stage in the afternoon the light company of the 5th was sent to reinforce Baring's garrison at the farmhouse. The battalion was commanded by Lieutenant-Colonel Linsingen and comprised 6 companies. 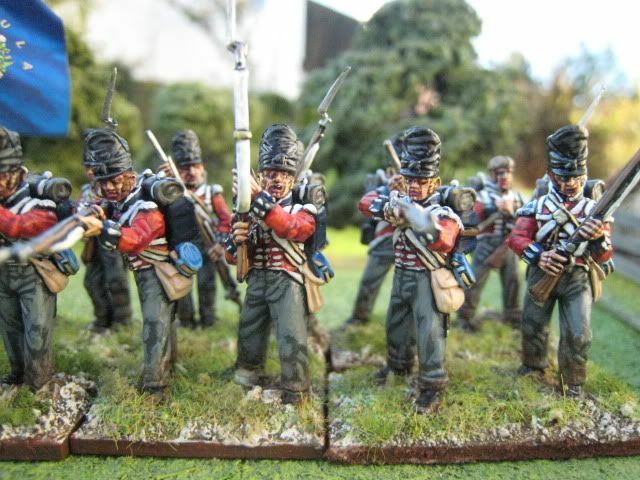 KGL line battalions had seen their complement reduced by the removal of troops to stiffen new Hanoverian units. As a result, the number of companies was reduced from 10 companies to 6. When La Haye Sainte finally fell around 6pm, the battalion was annihilated in a futile attempt to assist the garrison as it ran back toasted the Allied lines. When the garrison had finally be forced to leave the farmhouse, it found itself pursued and generally harassed by French infantry. The Prince of Orange ordered Lieutenant-General Charles Alten to send some infantry to assist them. Alten had two brigades in his 3rd Division, the second of which was the KGL brigade that included La Haye Sainte's 2nd Light Battalion. Alten ordered Colonel von Ompteda to advance. Von Ompteda queried the order on the grounds of having seen cavalry to his front. However, the battalion moved forward and after engaging some French infantry was set upon by cuirassiers and cut to pieces. 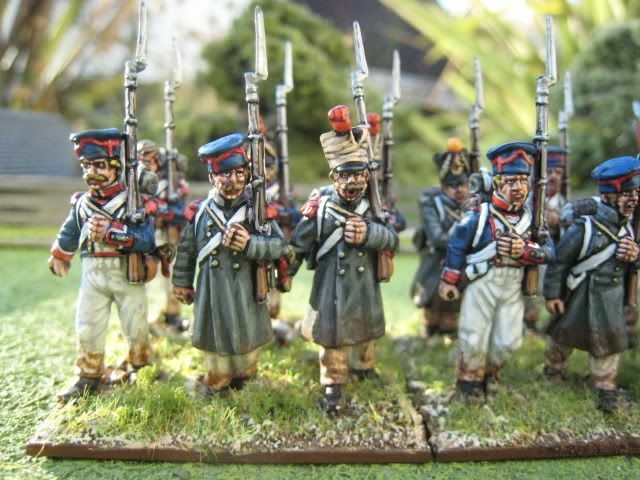 These figures are Perry plastics, which require you to do rather more gluing that is required for the French and Prussian sets. But you have plenty of variety and, as is no expected with Perry sets, lots of spare heads. 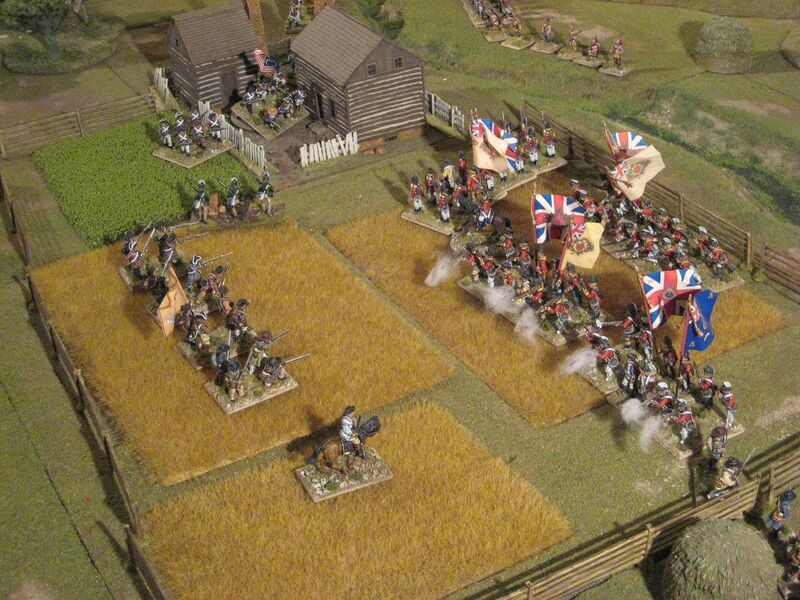 Given that the light company was sent off to La Haye Sainte, I based it on two bases with 2 figures each. The smaller number of figures required for the KGL battalions means that I used up all the flank company arms. The KGL had a couple of uniform differences from British line units. The backpacks were dark blue rather than black. The unit insignia was written in red on the sides of the packs - I gave this a go but it looked messy and to be in scale the writing has to be very small indeed; so I decided not to bother. For the same reason I decided not to add any insignia to the light blue water bottles. (I think you might be able to buy transfers for this sort of thing, which might work.) 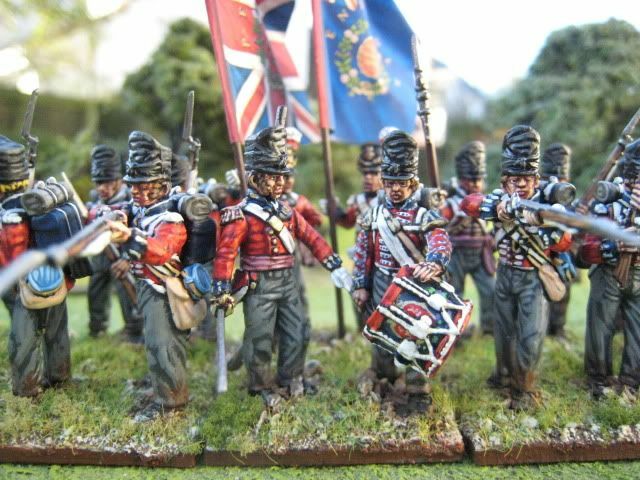 Otherwise, though, these are painted up as per British infantry. 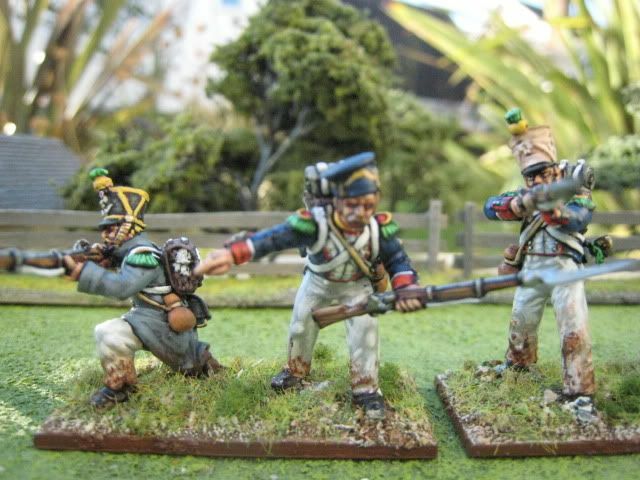 I have now painted all the 3 currently available sets of Perry plastic Napoleonic infantry. I still like the French figures the most - there is just something very satifying about both the figures themselves and the painting of them. These KGL figures were reasonably quick to paint, although I found the faces tricky to do. 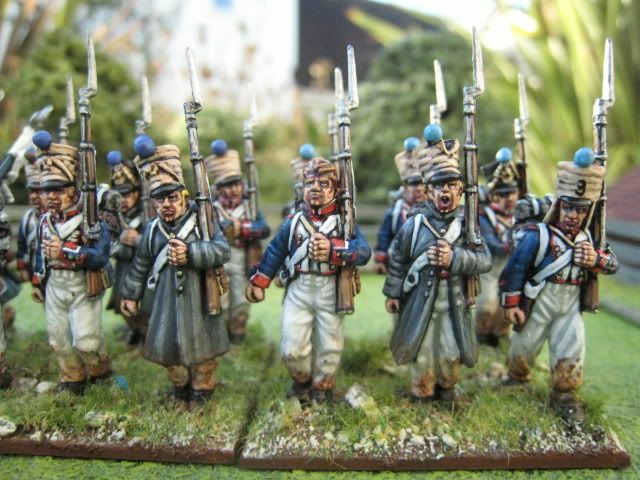 As with the Prussian infantry, I find that the hardest part to get right is the trousers; I wonder whether "less is more" when it comes to highlighting mid-grey trousers/breeches. Obviously I've now found somewhere to take photos. I need to experiment a bit with the light and which part of the garden works best, but taking photos inside isn't an option so it will have to be some part of the garden from now onwards. Anyway, next week I'll have the 3eme Ligne for Waterloo and after that more Carlist War stuff. 20 figures. Painted October/November 2011. Flags by GMB. I always post a review of the year on the anniversary of this blog's commencement. "Why bother?" I suspect many readers will ask, given that this blog has been dozing in winter quarters for large parts of the year, most recently over the past couple of months (when even I have been appalled at the poor number of posts). It's been a year of considerable upheaval, to be honest. Not just a large house move and very stressful sale of the old place, but various other personal stuff I won't bore you with. Suffice to say that the Kiwi and I won't miss 2011, although 2012 will bring its own challenges, I'm sure. Usually at this time of year the January gloom is warmed by the thought of our annual trip to New Zealand (and occasionally Australia), but we are not taking Hugo anywhere near a long haul flight after the poor lad's experience last March. So the next trip will be Christmas 2013, which is a long time to wait. I've been surprised to realise how much I will miss visiting NZ this year; it's beginning to feel like a second home already. In wargaming terms it has been a lean year: not a single game, only 1 show attended and far less painting time than I had anticipated. The year's painting tally, set out below, is pretty shocking when compare to the heady BHE days ("Before Hugo Era"). I like to think that I'm pretty adept at squeezing every ounce of painting time out of the day, but I need to make a better effort. I have already found myself cutting the odd corner to speed things up, like using base colour and 1 highlight instead of 2 (especially on things like musket stocks and bayonet scabbards. 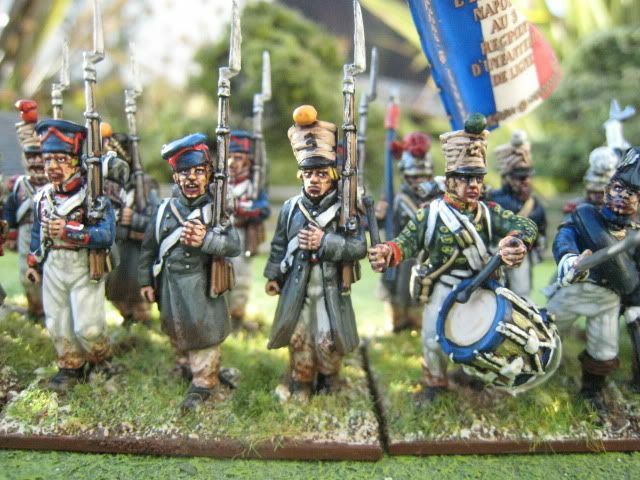 But a key reason why posts have been scarce the past few months is that my concentration on Napoleonics and resulted in the painting of large units which just take much longer to do. My last 5 painted units have have respective strengths of 26, 24, 18, 30 and 46 figures. That's 130 painted figures but only 5 posts' worth (I haven't yet posted on the most recent two, the 3eme Ligne and 5th KGL Battalion). 130 infantry figures in AWI terms would be 7 or 8 posts' worth. There are plenty of "small unit" options in my principal areas of interest, so I'm going to try to maintain a steady flow of those to ensure more regular posting. 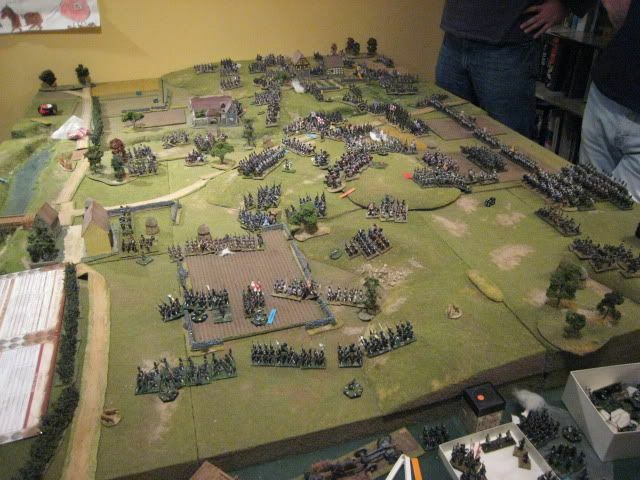 - AWI: 86 foot, 7 cavalry and 3 guns. - First Carlist War: 40 foot and 1 gun. - NZ Wars: 42 foot and 1 gun. 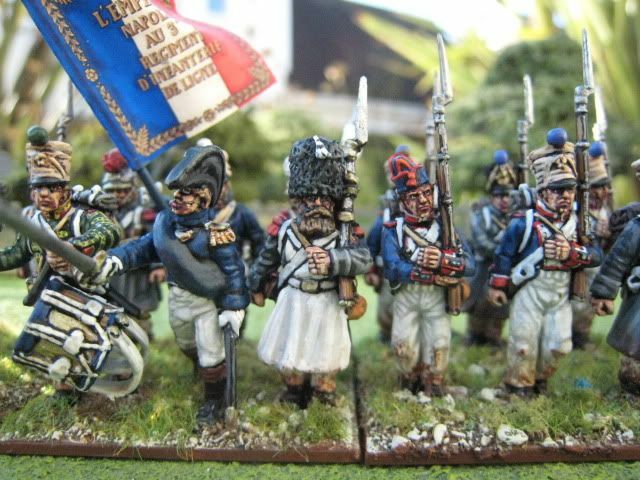 - Liberators (15mm): 24 foot. Counting 15mm figures as half a point each, that gives me 385 points, which is actually an improvement on last year's total of 340. Again it equates to just over 7 figures a week. I'm actually painting in batches of 8 now, rather than 6, but sometimes that takes longer than 1 week to finish. Highlights of the year (aside from watching Hugo's Santa impression, which is hilarious) were the publication of the deluxe edition of the "British Grenadier!" AWI rules (which contains many photos of my collection), visiting Eureka Miniatures in Melbourne, finally taking the plunge with the Liberators! 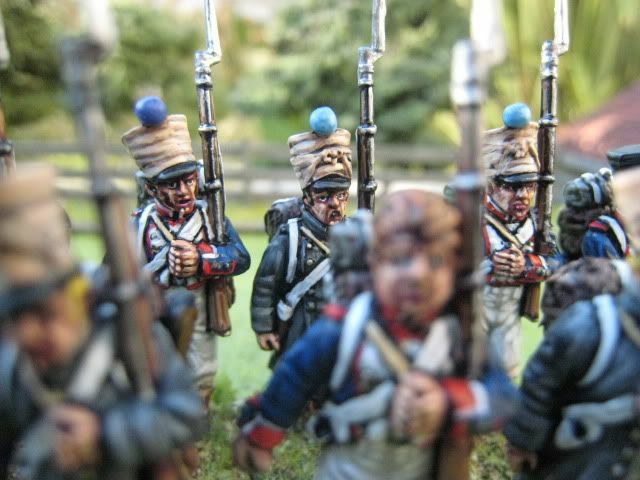 15mm range, spending a month painting the Empress Miniatures NZ Wars figures and seeing my 1815 collection expand . 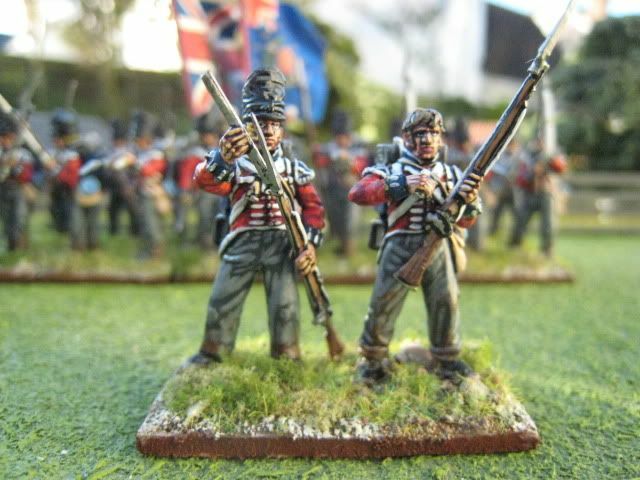 I have now painted all 3 of the Perry plastic 1815 infantry sets and I am convinced that hard plastic is the future of 25mm wargaming in this period. Plans for 2012? More of the same, really. 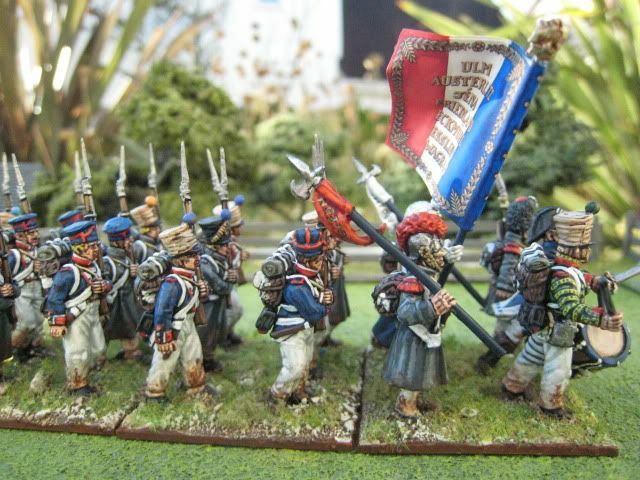 I expect I will paint more AWI and First Carlist War and fewer Napoleonics. I want to spend some more time on the Liberators! project and I've also promised Eclaireur that I will work on some more ECW. 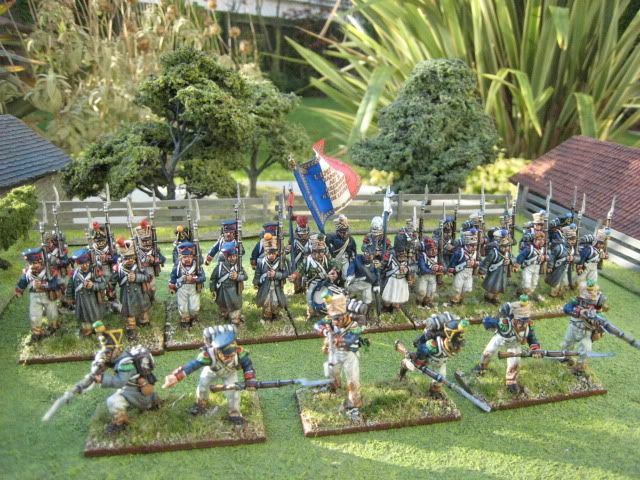 To be honest, the main reason the AWI has been on the back-burner recently is that I'm waiting for the Perry plastic figures to come out before deciding where to go with the British and American forces; that's also why I've only painted French infantry this year. 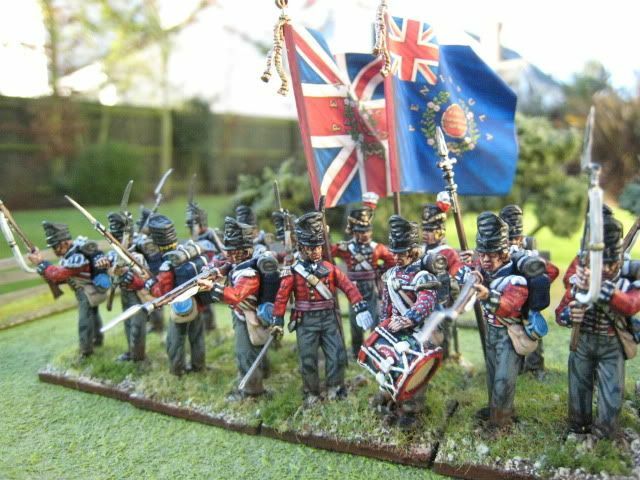 But there is the cavalry too, and I will press on with the Eureka dragoons. No doubt some other things will catch my eye as the year progresses. I have two games to post about shortly. The first, Freeman's Farm (top-right), took place in December 2010 and the second, Austerlitz (top-left), earlier this week. The reason why Freeman's Farm hasn't been posted about earlier is because I took photos primarily for inclusion in the new edition of "British Grenadier!". Now that has been out for some time, I feel there's no harm in posting some of the same pics on this blog.